Seat belts only provide an optimum level of protection during an accident when they are routed correctly. Correct seat belt routing reduces the risk of severe or fatal injuries. Correct seat belt routing also holds the vehicle occupants in position so that an inflating airbag can offer the maximum level of protection. Therefore you must always fasten your seat belt and ensure that the seat belt routing is correct. Assuming an incorrect sitting position can cause severe or fatal injuries . The shoulder part of the seat belt must always lie on the centre of the shoulder, never across the neck, over or under the arm or behind the back. The lap part of the seat belt must always lie across the pelvis, never across the stomach. The seat belt must always lie flat and snugly on the body. Tighten the belt if necessary. 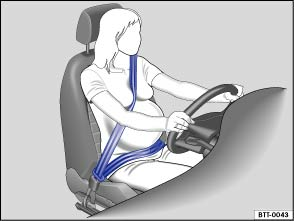 For pregnant women the seat belt must be positioned evenly over the chest and as low as possible over the pelvis. It must lie flat so that no pressure is exerted on the lower body – this applies in every stage of pregnancy . Belt height adjuster for the front seats . Incorrect seat belt routing can cause severe injuries in the event of an accident or a sudden braking or driving manoeuvre. The seat belts only offer best protection when the backrests are in an upright position and the seat belts have been fastened properly. The seat belt itself or a loose seat belt can cause serious injuries if the seat belt shifts from harder body parts in the direction of softer body parts (e.g. the stomach). The shoulder part of the seat belt must lie on the centre of the shoulder and never under the arm or across the neck. The seat belt must lie flat and snugly on the chest. The lap part of the seat belt must lie across the pelvis and never across the stomach. The seat belt must lie flat and snugly on the pelvis. Tighten the belt if necessary. For pregnant women, the lap part of the seat belt must be as low as possible over the pelvis and lie flat around the bulge of the belly. Do not twist the belt webbing while the seat belt is being worn. Never hold the seat belt away from the body by hand. The belt webbing should not lie over hard or fragile objects, such as glasses, pens or keys. Never use seat belt clips, retaining rings or similar items to alter the seat belt routing. If a person's physical build prevents them from routing the seat belt properly, contact a qualified workshop to find out about any special modifications so that the seat belts and airbags can provide the optimum level of protection. Volkswagen recommends using a Volkswagen dealership for this purpose.